Electroencephalography (EEG) is monitoring of brain wave activity. It is a noninvasive method of recording spontaneous electrical activity of the brain. A routine EEG is obtained with placing electrodes over a person’s scalp with a gel/paste, at specific locations. EEG measures the voltage fluctuations of brain cells (neurons), amplified, filtered and converted to digital signals. The storage of these signals is done electronically, for display. The advantage of digital recording is that settings can be changed later also for more detailed analysis and review. The “inter-ictal” EEG is to measure abnormalities in patients between seizures. Different activation procedures may be done, while recording to evoke abnormal brain activity. Hyperventilation, photic stimulation and sleep deprivation are common methods of activation. Reporting is done by neurologist, and the abnormalities are interpreted in the clinical context. Your doctor will discuss the result of the test, with you. Washing your hairs is the only specific preparation required. Do not put any types of cream or oil or spray on your hair. Patients needs to continue his/her prescribed medications before and after the test. It is not a painful test. Routine recording time for an inter-ictal EEG is approximate 30 minutes. After the procedure, paste will be washed away easily. It is diagnostic procedure of choice in a patient’s history of seizures. It helps to distinguish epileptic seizures from other paroxysmal spells of unconsciousness. It also help neurologists to recognize subtype of the epilepsy and decide the appropriate drugs for the patient. While planning for tapering or stopping of an antiepileptic drug, EEG is a useful marker. In an ICU set up, EEG helps to diagnose non-convulsive status epilepticus and different types of encephalopathy. It is often done to monitor effects of sedative/anesthesia in patients in medically induced coma. EEG is also helpful for diagnosis of various sleep disorders and intracranial infections, like herpes simplex encephalitis or CJD. In patients with coma, EEG often helps to prognosticate. It also serves an adjunct test for brain-death. 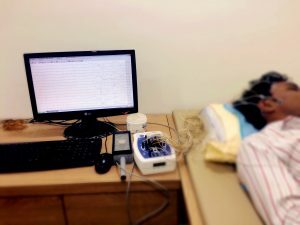 Sometimes, EEG recording during the epileptic event (“ictal” EEG) is required to confirm the diagnosis of epilepsy, to know the onset of electric activity and spread and also to identify specific epileptic syndromes. Patients are usually admitted for 3-5 days in the Epilepsy monitoring centre, for long-term EEG monitoring (LTEM). With scalp electrodes on a patient’s head, continuous recording of EEG is done, synchronized with video and audio inputs. Actual seizure recording gives better information regarding the focus of brain, from where the seizure activity starts. It is commonly done, as workup for possible epilepsy surgery in cases of focal/partial onset intractable epilepsy. 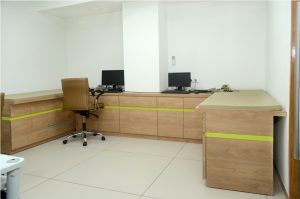 We have best-in-class, four digital EEG recording machines, at our centre, with additional video synchronization. Our neurologists are experienced in reporting of all types of EEG procedures, and for all age groups.We also provide facility for portable EEG recording at any medical centre/hospital /ICU across the city of Ahmedabad. In most of the case, EEG reporting is done on the same day of procedure and the complete record is given in a CD to the patient; for review at a later stage.